Not to be confused with Spiked Ball. The spike ball is an ability learned by Bowser in the DS game, Mario & Luigi: Bowser's Inside Story. The ability is learned at Peach's Castle Garden when Mario and Luigi cure Bowser of his back pain by drilling into the center of the Lumbar Nook. When they finish the process, Bowser's back loosens; he becomes more flexible and can use the spike ball ability. This ability allows Bowser to roll up into his shell to become a spiky ball when the player selects the ability using the shoulder buttons. He can use this ability to climb walls of soft dirt, smash through certain objects, get shot through a spring and activate treadmills in the overworld. A slightly similar ability was utilized by Bowser in Super Mario Galaxy during the last fight against him in the final galaxy of the game, Bowser's Galaxy Reactor. It could be countered by spinning a rubbery bulb at him during the second phase of the fight. In Super Mario Galaxy 2 during the final battle, he would briefly use this ability to move from side to side, during which the meteorites would bounce right off him if ground-pounded at him. He also uses this move during the first battle against him in Mario & Luigi: Dream Team. First, he blows fire across the path and then curls up to chase Mario. The player must jump over the smaller fire walls and move around the big ones. Eventually, Bowser will trip and the chase will end. When Bowser learns the spike ball, he suggests that he could never roll up into a ball before. However, the Special Attack Shy Guy Squad has Bowser roll up into a ball so the Shy Guys can push him into a rope before he is launched at the selected target. These Shy Guys can be rescued long before Bowser learns the spike ball ability. 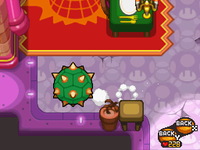 Sprite of Bowser using the spike ball ability. This page was last edited on March 13, 2019, at 09:14.